(AUSTIN) — Too many people sit in county jails in Texas awaiting trial when they pose no threat to the public or to miss their court date, simply because they can't afford the money to make bail, according to two lawmakers on Monday. Houston Senator John Whitmire and Kerrville Representative Andrew Murr say the current bail system keeps low-risk, non-violent, and indigent defendants locked up for no other reason than they lack the means. At the same time, violent offenders who pose a threat to public safety are out on the streets if they have the money. "The bail bond system that exists in Texas is unfair, unconstitutional and it has all types of terrible outcomes," said Whitmire. The two legislators filed companion bills in each chamber, SB 628 and HB 1323, to reform the bail system in the state to let people who pose no threat to public safety avoid lengthy pre-trial detention while keeping those who may hurt others behind bars. The two measures are named for State Trooper Damon Allen, who was killed in the line of duty during a routine traffic stop by a man out on bond for charges of a previous violent offense against a peace officer. 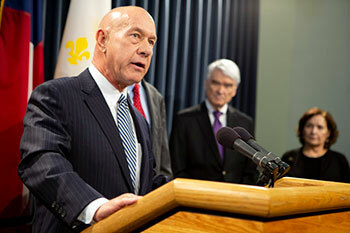 Houston Senator and Criminal Justice Committee Chair John Whitmire announced at a Monday press conference the filing of legislation to fix a bail bond system he believes is unfair to defendants who can't afford it. Whitmire said that three-fourths of the population of county jails in Texas are accused defendants awaiting trial, up from a third 25 years ago. More than that, it costs counties almost a billion dollars a year to house these inmates. They may be unable to afford sums of a few hundred dollars, leading to situations where they spend more time in county jail awaiting a hearing than they would if they were convicted of the crime for which they are accused, he said. These people are accused of non-violent offenses and pose no risk to society, yet they sit in county jail for weeks or months, possibly losing their job, creating stress and tension within their families and exacerbating existing mental health issues, added Whitmire. The two lawmakers were joined by Chief Justice of the Supreme Court of Texas Nathan Hecht, who said he stands behind these reform efforts. He said while pretrial detention has its place, it should not extend beyond what is justified. "Today, many of our citizens are incarcerated in local jails, not because they are dangerous, but simply because they cannot afford the amount of money bail," he said. "People are held who should be released and people are released who should be held." As it stands, said Hecht, only the nature of offense determines bail decisions. Hecht believes that automated and validated risk assessment tools can, with just a few pieces of demographic data, better predict the risk a person poses to flee, re-offend, or commit violence. Under the bills, judges or magistrates conducting bail hearings must use a system provided at no cost by the Office of Court Administration to assess the flight or public safety risk when considering whether to set a cash or personal bond. The assessment can be performed by a designated employee of the court and must be made available to the judge as soon as possible but no longer than 48 hours after arrest. The judge shall impose the least restrictive conditions of release and the minimum amount of bail, or personal bond, required to ensure the defendant's appearance as well as public safety. The bill does give judges discretion to deny bail in cases where they believe release will endanger public safety or that the person is a significant risk to skip bail. It permits the use of the risk assessment tool results in this decision as well. Similar legislation died last session, which Whitmire blamed on a strong lobbying effort on behalf of the bail bonds industry. He's more hopeful that the legislation has a better chance this year. "I think through education and a lot more networking…and surely the federal lawsuits have gotten people's attention," he said, referring to federal judicial rulings against cash bond programs in Dallas and Harris counties, which found that those systems discriminate against poor defendants. The Senate will reconvene Tuesday, February 5th at 10 a.m., and will then move to the House Chamber for a joint session to hear Governor Abbott's State of the State address at 11 a.m.